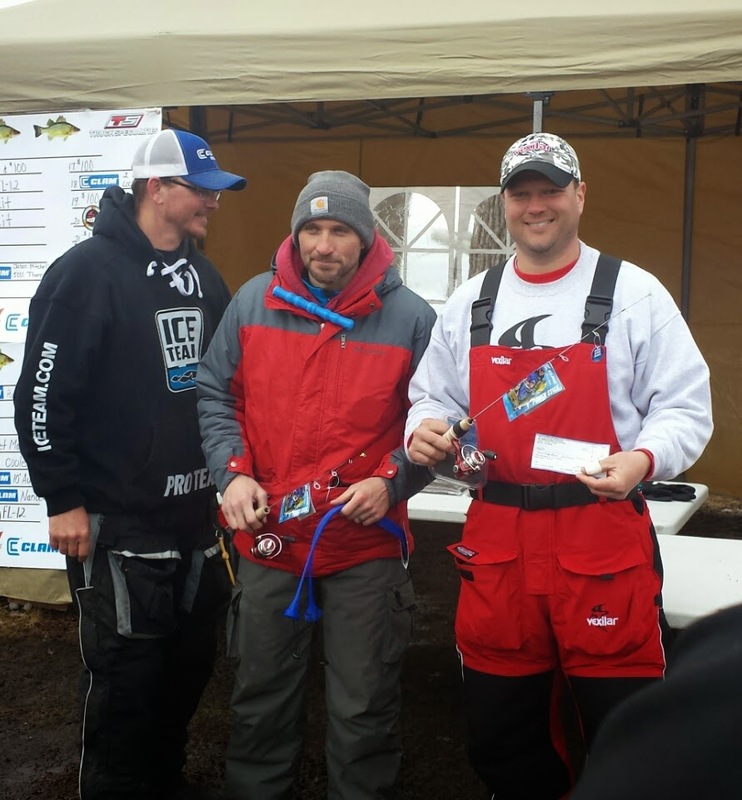 Another angler is "HOOKED" on ice fishing. From time to time my email or phone lights up with the opportunity to do a guide trip. Whether it is on the boat or on the ice, someone is reaching out to me to help them have a nice day of fishing. Some trips are all about learning the game of fishing, or to increase an anglers talents, but this one was to introduce a young man to sport of ice fishing. "Grandpa" wanted to get his grandson out on the ice to help spark another hobby that he and his grandson could enjoy together. Both were very nice people and wanted the day to begin quickly as both were excited to catch some fish. A quick lesson with the Vexilar and the young man realized that it was a little bit like a video game. I knew right away that he grasped the concept of the Vexilar read-out and he was off fishing. Within 5 minutes of fishing he caught his first ever fish through the ice. 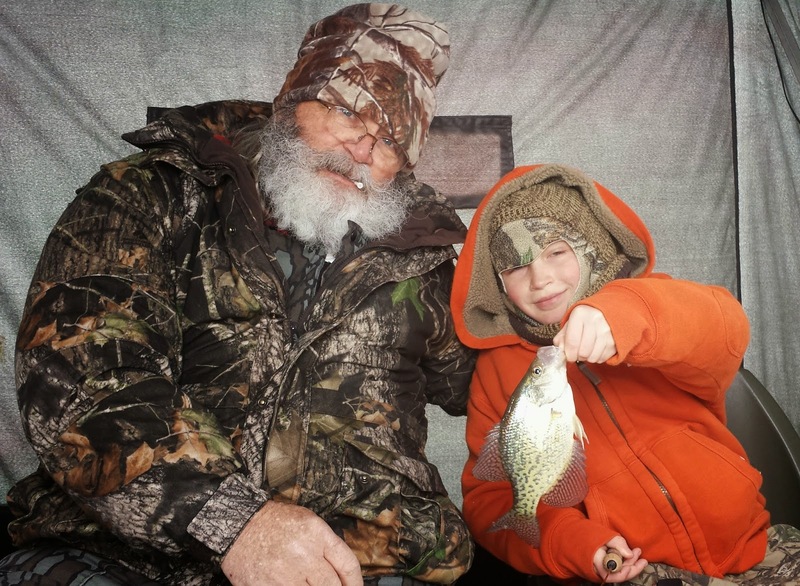 Although it was early in the trip, and he was a little bit cold, he sure let grandpa know who caught the first fish the rest of the afternoon. It was a nice few hours on the lake with two new clients. The goal of hooking another youngster on ice fishing was accomplished, and to me that meant great success. Brushy Creek Lake, but in teh end it was all worth it. 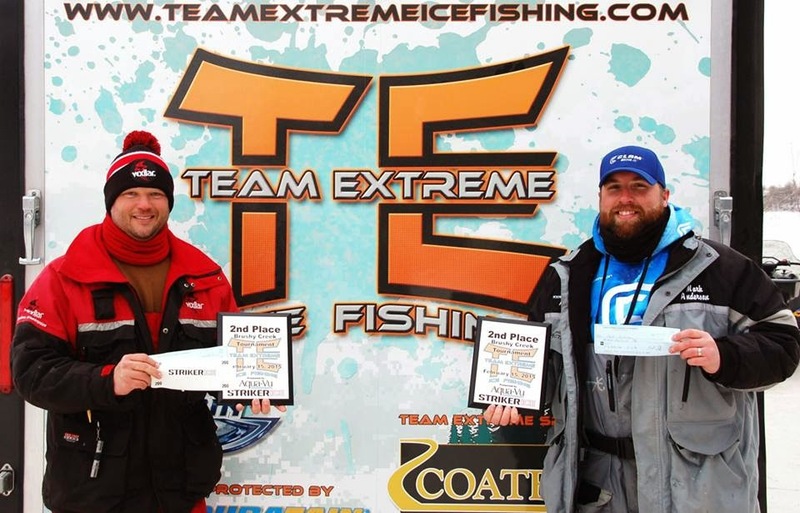 The third tournament of the Team Extreme Ice Tournament trail took us to Brushy Creek Lake. 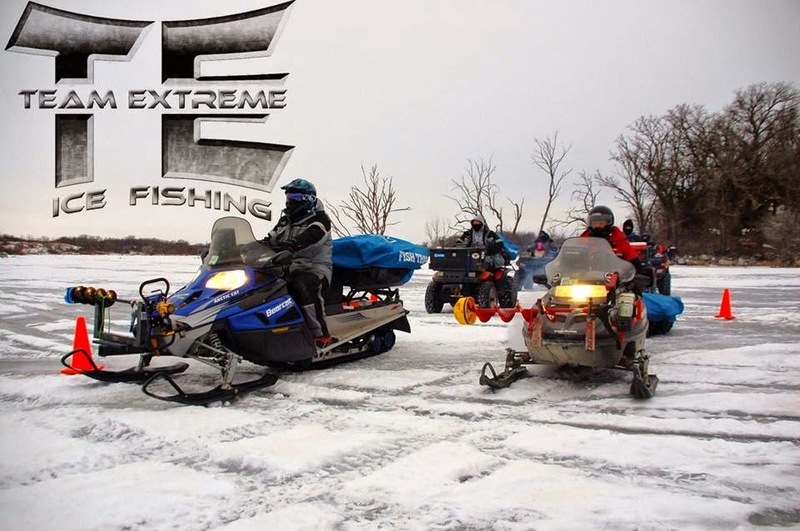 Mark Anderson and I made a pact at the beginning of year to fish all four of the Team Extreme events. This tournament was the one we were most worried about. We had both spent time on Lake Okoboji, the first event, Mark really knows Big Creek Lake which was the second event, and I have spent countless hours on Rock Creek Lake which is the last stop in a couple weeks. However, I had never ice fished Brushy Creek Lake, and Mark had only been a couple of times. Needless to say we had our work cut out for us. We spent a full day last week on Saturday looking around the lake. I have fished this lake dozens of time from the boat so I did have knowledge of how the lake is set up and where many of the main structures are in the lake. After searching much of the day and coming up empty we did end up with a couple good areas for bluegills. The crappies were still a little bit of a mystery. After trading notes all week long and studying the map some more we met up the day before the tournament for another look around. Mark was able to fish on Friday and found good a crappie spot. That was great news to hear. We spent another full day on the lake in 30+ mph winds and temperatures in the teens. It was a test of not only fishing, but a mental and physical test too. We hit a lot of areas and added to our game plan. We ended up only fishing two areas on tournament day. Like most teams in the event, we hit our crappies first and got a limit fairly quickly. We continued to catch and upgraded our sizes. We moved shallow on the same location and picked up a couple bluegills to add to our bucket. The tournament limit is 8 crappies and 8 bluegills, so we had to continue to find and catch some more gills throughout the morning. We made the run to another area where gills were caught during practice. We ended up staying there until the end of the event. We caught gills in the 14-24 foot range. The best areas seemed to be just off the cover. Finding these areas were pretty easy with the use of our Vexilar FLX-28's. I found it key to be off of the standing timber. Finding areas that showed green tree limbs on the Vexilar were key, and it was where the bluegills were cruising. Another key feature of the FLX-28 and ProView transducer was the capability of picking of up 3mm Sportsman Direct Tungston Heavy Metal jig near that brush. Take those features and the ability to zoom into the bottom 6 feet of the water column really gave me a leg up on the gills. We never made it to any other area on the lake, we felt that if we continued to upgrade our fish, then we might as well just stay put. That plan worked well, and once again Mark and I fished great together. We seemed to be on the same page all day long, and when one guy wasn't catching fish, the other seemed to be and that raised each of our spirits. We were in the lead for Team of the Year points before this event by 3 points. In the points standings, each place is worth one point, so every place you slide down, your points slide down too. We weighed in our 16 fish for 8.71 pounds for second place, and the winners had 8.93 pounds. This keeps us in first place, and we extended our lead to 6 points. Just a few days until the final tournament at Rock Creek Lake on March 1st. 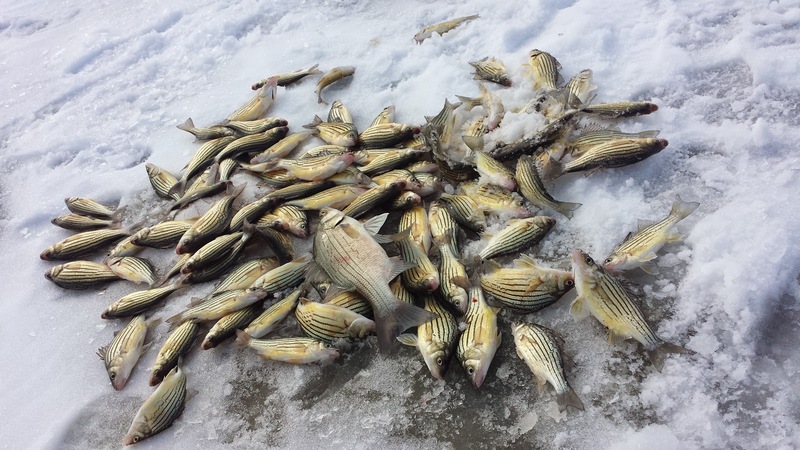 Clear Lake, Iowa is the home to Yellow Bass Bonanza. In the few times I have visited this town to fish the lake it appears that the town revolves around two things, The Surf Ballroom and Clear Lake. Fishing is in the blood of this community and it shows to whomever you choose to strike up a conversation with. It truly is a "lake town" which is so rare in Iowa. 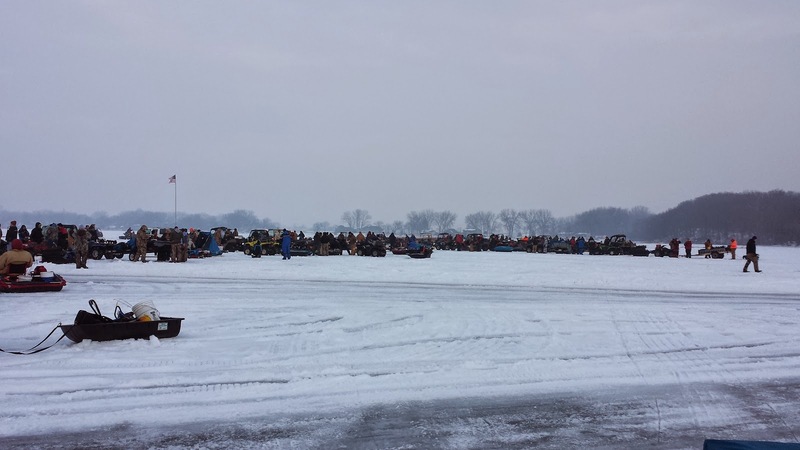 Clear Lake is fast becoming known for one of the hottest ice fishing events in the Midwest too. The Clear Lake Yellow Bass Bonanza, hosted by local fishing guide Kevan Paul is fast becoming the talk of this state and many surrounding states. 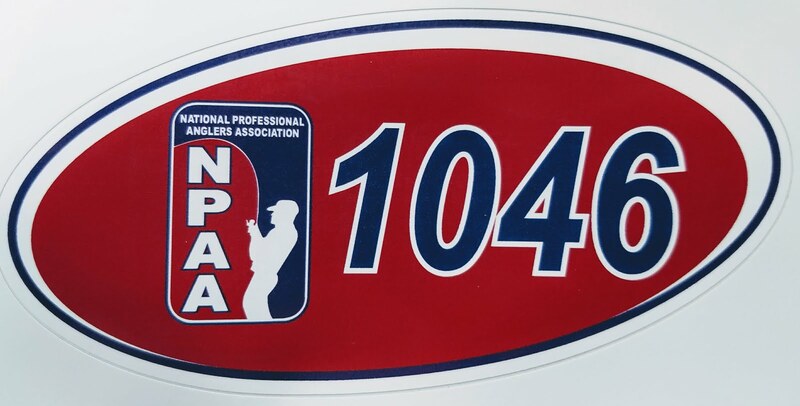 2015 marked the 3rd year for the event and it drew 254 teams, or 508 anglers. I have never participated before but my friend Jacy Large twisted my arm enough and threw our names into the tournament this year. I sure am glad he did. This event brought over 500 anglers to Clear Lake over 10 different states and even a team traveling from Canada. I was able to catch up with many "Internet friends" and finally speak face-to-face with them which is so rare anymore. That, along with the fishing Clear Lake made the weekend one I won't soon forget. We showed up in Clear Lake just in time for the pre-tournament meeting at the Surf Ballroom. That was first for me and the place is really amazing. This was a great time with a meal and that rare chance to chat with friends rarely seen. We headed back to our cabin for the night and after some talking about strategy for the next day I was asleep pretty early. Tournament morning, to say the least was a bit tricky. It was raining in Clear Lake and put a thin layer of ice on the roads. This meant for some careful driving and a few moments of laughter. We got to the launching area and decided waiting in the truck as long as we could to avoid getting all wet was the first plan of the day. That was a good plan, as the rain had just about all stopped at 8am. We quickly unloaded the equipment and off to the starting point. The Yellow Bass is fun fish to catch, when you can find them. They are constantly on the move causing anglers to drill many holes throughout the day and possibly relocating all-together. We chose one area to start fishing in about 10 foot of water on the big lake. 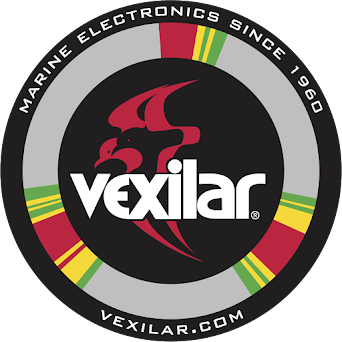 We took our Vexilar FLX-28's and quickly checked the holes to find active fish. In under an hour we caught 63 fish. It was quite a thrill to catch fish that quickly. The bite slowed the next couple of hours and in the final hour we decided to make one last move. We moved up into about 8 feet of water and drilled another 20 holes or so. Again, a school of fish showed up and we caught them as fast as you could get your bait back down the hole. Jigging spoons and larger ice jigs were the best baits, and we would switch back and forth if a Yellow didn't want one offering. The typical baits worked, waxorms, spikes and cutbait as long as we kept switching things up once in a while. The final few minutes of the tournament came and the sorting of our fish had to begin. 50 yellow bass could be weighed in for our team total, we sorted through over 100 fish to get our best ones ready for the weigh-in. I also had a nice White Bass that came in the middle of that first hour of rapid catching of the event. The white bass was a separate "big fish" contest within the regular yellow bass tournament. When things were all said and done, we had caught the 3rd biggest white bass, which turned out to be worth almost $200 and ended up 5th place out of the 254 teams. That gave us a nice check and some new Clam Outdoors rod/reel combos and other Clam merchandise. A great day on the ice to say the least. For complete results, many pictures and video of this event click HERE. February 1st brought the first snowstorm of the year to Iowa, and it was quite a storm. We recieved about a foot of snow after quite a bit of rain and drizzle. 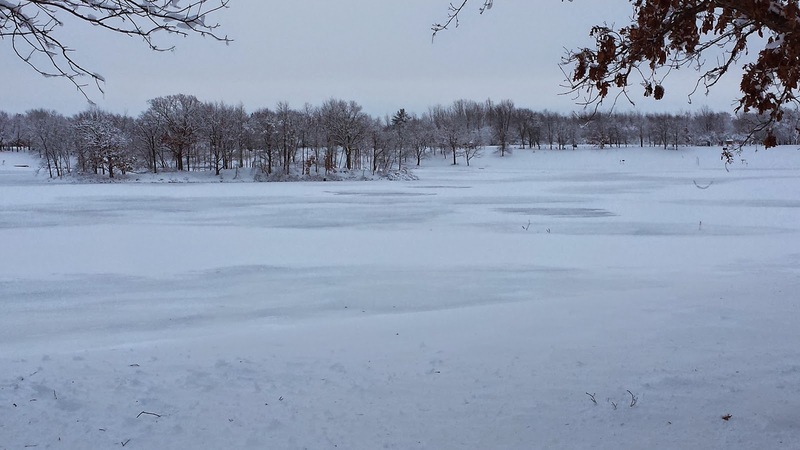 This followed a week of high temperatures and has all ice anglers a little on the edge. I for one am not ready to even think about the end of the ice season. However, with the warmer weather followed by the rain and foot of snow, you just never know what the condition of the ice may be. Today, curiously got the best of me, so I decided to take a short trip to Hickory Grove Lake to see for myself. I was totally shocked to see how well the ice looked. I measured over ten inches in several places I checked. The top 2 or 3 inches being melted snow, but the bottom layer of ice looked great and cut very hard with the auger, showing that it has a lot of strength left. Although the couple hours of fishing was disappointing, the look and fell of the ice was a welcomed site. Be careful out there the next few weeks, and good luck to you.